Protestants affirm the principle of sola Scriptura—Scripture is the only inallible authority for the Christian. Yet even that principle is a confession, a mini-creed if you will. Creeds and confessions are an inescapable part of being a Christian in this fallen world, and they have an authority over believers. 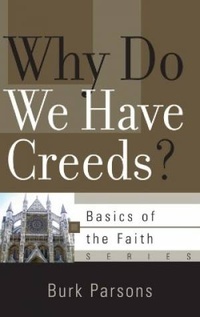 In this booklet, Burk Parsons examines the complex issues of creeds and confessions. He looks at what it means to be confessional, how one can affirm sola Scriptura and yet still subscribe to a particular confession, and many other issues. It is a helpful look at the importance of creeds and confessions in our day.